JERUSALEM (AP) — An international watchdog organization has slammed Israel for its treatment of thousands of African migrants, saying it is forcing them to leave the country at grave personal risk. In a report issued Tuesday, Human Rights Watch says Israeli authorities have coerced almost 7,000 Eritrean and Sudanese to return to their homes, where they may face serious abuse. In response to the report Israeli Interior Ministry spokeswoman Sabine Haddad said Israel was dealing with the challenge of the migrants in a legal and appropriate way. “The growth in the voluntary repatriation of the migrants by three times from 2013 to 2014 proves that the policy is working,” she said in an email. The report says that some returning Sudanese have faced torture, arbitrary detention, and treason charges at the hands of the anti-Israel Sudanese government, while returning Eritreans also risk harassment. 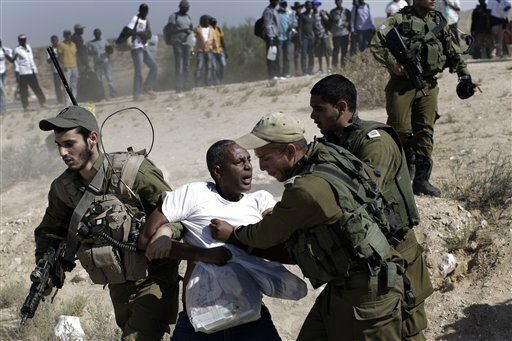 For the past several years Israel has been placing thousands of Eritrean and Sudanese migrants in hardscrabble detention centers in the Negev desert. Citing statements by senior Israeli officials including former Israeli Interior Minister Eli Yishai, Human Rights Watch says the aim of the policy is to make life so intolerable that the migrants leave Israel on their own volition. Since 2006 some 50,000 Eritreans and Sudanese have entered Israel illegally via the Sinai desert, causing great consternation in the mainly poor Israeli neighborhoods where they have settled. Neighborhood residents say the migrants engage in petty crime and help turn the areas into slums — claims that have placed great pressure on officials to act to limit the number of migrants in the country. Like many economically advanced countries in Europe and elsewhere facing their own migrant influxes, Israel offers poor African migrants relatively good opportunities to improve their economic standing. Many are now employed in menial jobs in the hotel and restaurant industries in Tel Aviv and the Red Sea resort city of Eilat.